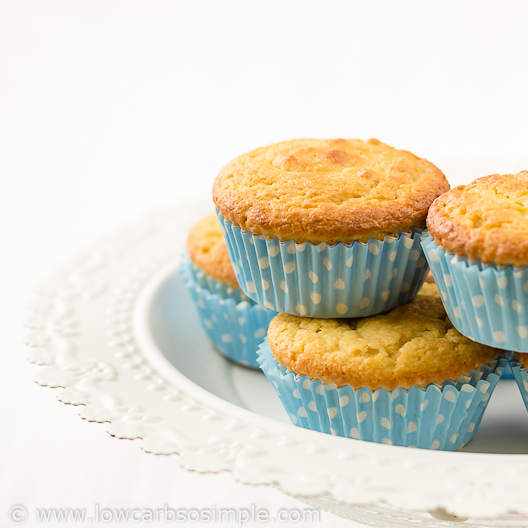 Unusually Fluffy Muffins (Dairy-Free) | Low-Carb, So Simple! Well, this basic muffin recipe is far away from being boring. The muffins are extremely fluffy, thanks to baking powder and sparkling water. Those two ingredients together make the muffins rise enormously and give extra fluff and airiness in the texture. And not to provide you with just a plain basic recipe, I’ve included a lusciously lemony variation as well! It’s bursting with fresh and tangy lemon flavor. And to make things still a tad more tempting, I made also whoopie pies using the lemony batter (and this orange butter frosting as filling)! Oh mine, talk about lusciousness! Like you might remember from my last blog post, a few days ago I received some samples of Natvia sweetener. I’ve used here Natvia for Baking because the basic recipe was a perfect way to test how the sweetener tastes in baked goods and how it actually behaves in baking. I’ve developed this recipe ages ago, but I fine-tuned it last fall. In the original recipe I used erythritol crystals, but now I wanted to try out how Natvia for Baking works in practice. That sweetener is not fine powder, but something between powder and hard crystals. Very very tiny granules, I would say. And as I told in my last post, this sweetener has a strong odor of caramel. Personally I like that very much. I made a test batch of muffins with Natvia and the result was very nice. I couldn’t taste basically any aftertaste of the sweetener, nor smell any caramel flavor. Well, the muffins were fluffy and the taste was basic but very good. I didn’t even add vanilla extract because I wanted to ensure that there are no additional flavors so that I can taste the possible aftertaste of the sweetener. But as I said, there was basically no aftertaste. Now, this is just my own personal opinion, and those with more sensitive taste buds — and who are new to erythritol-based sweeteners — might indeed taste something extra. I also baked whoopie pies using the lemony batter (recipe in the end of the post). Actually, the whoopie pies, or the cake part, had somewhat hard and crusty surface. I wanted to try out if other erythritol-based sweetener brand causes the same result. I made a second batch with that other sweetener, and immediately after removing the whoopie pies from the oven they were very soft. However, as soon as they cooled down to room temperature, they developed that hard crust. This hard crust is actually a nice counterpart to the soft inner part, but if that crust disturbs you, you can use less erythritol-based sweetener (let’s say 1/4 cup = 60 ml) and then some liquid stevia (like 20 drops NuNaturals Clear NuStevia) or stevia powder in addition to help keep also the outer part soft. Erythritol easily creates hard crust, and by using two different types of sweeteners you get softer result. Preheat the oven to 350 °F (175 °C). One batch makes 6 medium-sized muffins so take 6 sturdy medium-sized paper liners and line a muffin pan with those. Using good-quality liners pays off, you won’t have any problems in removing the ready muffins from the liners. Combine the coconut flour and the baking powder in a small bowl. Combine eggs, sparkling water and sweetener in a large bowl. Add the coconut flour mixture to the egg mixture. I just usually throw in the flour mixture all at once but to ensure absolutely smooth result, you can sift in the flour and whisk all the time while adding it. The batter will thicken after a couple of minutes. Bake for 20 minutes, or until a stick inserted in the middle of a muffin comes out dry. Here they are after 10 minutes. After 20 minutes they look done, I just test them with a toothpick. Line a muffin pan with sturdy paper liners. Combine the coconut flour and the baking powder in a small bowl. Mix well. Combine the eggs, sparkling water and the sweetener in a large bowl. Whisk until well mixed. Add the coconut flour mixture to the egg mixture and whisk until smooth. And here is the long-awaited citrus-bursting luscious lemony variation! I bet you cannot keep your fingers off of these flavorsome treats! I just got an idea to add 1 tablespoon poppy seeds to the batter, that would make some ultimate lemon poppy seed muffins. Oh yes, unfortunately the recipe plugin (which I use above for the fluffy muffins) allowed only one recipe per post, so I had to use the old format for the recipe below. And I just was so happy that I finally found a great recipe plugin which also allows you to print the recipe! Sigh. Wash the lemon and pat dry. Grate the peel with a small grater. Use only the yellow-colored part as the white pith gives bitter flavor. Squeeze 1 tablespoon lemon juice from the lemon. Place the peel and the juice aside for a while. You’ll need them soon. Combine the eggs, lemon peel, lemon juice and the sweetener in a large bowl. Whisk until well mixed. Like said, I made some incredibly delicious whoopie pies from this lemony batter. I baked the batter in a whoopie pie pan (it took something between 10 and 15 minutes) and filled the cooled whoopie pies with this frosting. Indescribably delicious! Can’t wait to make these! Quick question: can I substitute baking powder with baking soda, and in the same quantity? And is it also okay to just use lemon juice? Hi Jax, baking soda should work, the acid lemon juice helps rising so there is no need to use vinegar. If you try that, please let me know how the muffins turned out! I tried the muffins today with equal amount of baking soda instead of baking powder. I also left out the lemon pieces since I only have lemon juice and used erythritol that wasn’t in a powdered form. Long story short, they came out really bad 🙁 It tasted like I was eating a cleaning product! I suspect that it was the baking soda since there was a little bit of a metallic taste. They otherwise rose well, had nice texture and held together better than most muffins when I cut them open. So much for neutralization from the lemon juice. I only cooked half of the batter. Any suggestions on what I can add to save the rest of it? I don’t have baking powder and don’t plan on buying any just for half a recipe. Otherwise, I’m just going to throw out the remaining batter. Hi Jax, sorry to hear about your bad experience. Obviously baking soda is not a good option for these muffins, thanks for trying it anyway. I doubt adding spices would help, that first came into my mind. I guess the metallic (or cleaning product) taste cannot be covered. I wonder if anybody has any other suggestions? Make your own baking powder, its just a mixture of baking soda and cornstarch, basically. Google for recipes. You can just leave out the cornstarch if that bothers you. Its just used as a bulking agent, from what I recall. So in essence, you’d need alot less baking soda. Make sure you use an acid for the baking soda to react with. Thanks, Hélène! Indeed, using less baking soda might do the trick. Here the lemon juice acts as acid, so I think other acid (like vinegar) is not needed. Thanks, I don’t have cornstarch on hand so I will experiment with adding more lemon juice in order to activate the baking soda. Can’t figure it out, but my batter is like 2x as thick as the batter in the picture and the muffins come out all sad and dry-looking. I even tried adding an extra 1 T of sparkling water and the batter still looks drier than here. Any suggestions? Thanks! So sorry to hear that the result wasn’t satisfying. Hmm, sounds that there was too much coconut flour. The tablespoons should be loosely scooped, not packed. If you weigh it, it should be 37 grams (1.3 oz). Hope this helps! Wow these look great. Do you know what the sugar equivalent to the 1/3 cup natvia would be because I’ve got truvia blend which is a mixture of sweetener and sugar and want to work out how much I’d need? Hi Jas, I would start with 1:1 and check what kind of result it brings. Wow,i just made these lemon m uffins with orange instead of lemon…..delicious…but mine do not look as light and fluffy as in the picture…maybe i overstirred,overbaked? I made mini muffins…but definitely will make again…delicious! Hi Rosalyn! Great that you liked the recipe! I bet orange tasted wonderful with these. Overstirring or overbaking might cause flatter muffins, but what you can try is to use some orange flavor (teaspoon or so) or grated orange peel (only the orange-colored part) and add sparkling water as the rest of the fluid. Sparkling water really helps make the muffins fluffy!
. Don’t I need another tablespoon of liquid in the lemon muffins? Wanted to be sure before I put these together. Hi Jeanne, yes, the second recipe contains less liquid on purpose. You see, the first recipe uses sparkling water and the second one lemon juice. These liquids behave differently in baking. If you use 2 tablespoons lemon juice, the muffins will be soggy. I tested that 🙂 Hope this helps! Hi Hélène, you don’t want to drink the rest? 🙂 Anyway, if you make bigger batch you can freeze the muffins. Hope you like them! I will be making these tomorrow for my Beth Moore bible study ladies. I think I will add strawberry flavor to the recipe. Just starting out and love all your cooking and baking ideas. Hi Denise and thanks for your comment. Great to hear that you like my recipes, hope you also like this one! Hi Eve, that’s great to hear! Yes, there are never enough low-carb high-fat recipes… Hope you like these if you try out!